I am so delighted to be working with a LOT of really talented bloggers to put together the Great American Bake Sale: Washington, DC. Here’s our official press release. Please, help us promote this event! Want to get involved? Get in touch! We need bakers, drivers, and charming sales people. I’m working on figuring out the whole badge thing, I am such a technodork. But the resource center for bake sale participants is rocking! Recipes, ideas, banners, examples from previous bake sales. It’s so inspirational and well organized. I have pie-deas. Savory and sweet. The rockstar list of bakers is growing, so remember, if you can’t bake for the sale, surely you can come shop? Put the date in your calender now – April 26, 2012, from 2-6pm. * More than 30 D.C. Food Bloggers are joining the fight against childhood hunger in America. It’s a simple as hosting a bake sale. * Washington, D.C. Food Bloggers are having bake sale, as part of Share Our Strength’s Great American Bake Sale, a national campaign that mobilizes Americans to end childhood hunger by holding bake sales in their communities. The bake sale is part of a larger national food bloggers bake sale. D.C. aims to have the highest grossing bake sale of the week. * Washington Post building, 1150 15th Street NW. The bake sale will be set up on the first floor. * This year, nearly 1 in 5 children across the country will struggle with hunger. That’s more than 16 million kids. Funds raised through the D.C. Food Bloggers Bake will be used to support Share Our Strength’s No Kid Hungry campaign, that aims to end childhood hunger in America. No Kid Hungry works to surround kids facing hunger with nutritious food where they live, learn and play. Share Our Strength’s Great American Bake Sale®, co-presented by Domino® Sugar and C&H® Sugar, and Duncan Hines®, is a national effort that encourages Americans to host bake sales in their communities to support the No Kid Hungry® Campaign, Share Our Strength’s national effort to end childhood hunger in America by 2015. Since 2003, more than 1.2 million people have participated in Great American Bake Sale, raising more than $8 million to make sure there is no kid hungry in America. Great American Bake Sale is supported by official bakeware partner Chicago Metallic, national television partner Food Network, national magazine partner Family Circle, and official baking ingredient partner Solo. 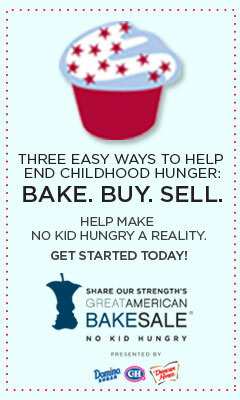 Visit GreatAmericanBakeSale.org. Share Our Strength®, a national nonprofit, is ending childhood hunger in America by connecting children with the nutritious food they need to lead healthy, active lives. Through its No Kid Hungry® Campaign—a national effort to end childhood hunger in America by 2015—Share Our Strength ensures children in need are enrolled in effective federal nutrition programs; invests in community organizations fighting hunger; teaches families how to cook healthy, affordable meals; and builds public-private partnerships to end hunger, nationally and at the state and city level. Working closely with the culinary industry and relying on the strength of its volunteers, Share Our Strength hosts innovative culinary fundraising events and develops pioneering cause marketing campaigns that support No Kid Hungry. Visit Strength.org to get involved. Looking forward to being part of this wonderful event! Thanks for pulling it together, Cathy!